Probably the most familiar 3D chess variant to the general public in the middle 20th century and early 21st century is the game of Tri-Dimensional Chess (Tri-D Chess), which can be seen in many Star Trek TV episodes and movies, starting with the original series and proceeding in updated forms throughout the subsequent movies and spinoff series. 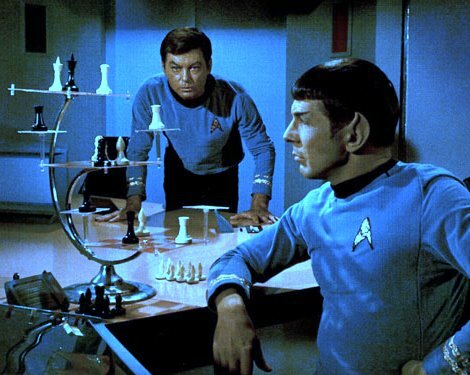 The original Star Trek prop was assembled using boards from 3-D Checkers and 3-D Tic Tac Toe games available in stores at the time (also visible being played in the original series episodes) and adding futuristic chess pieces. Rules for the game were never invented within the series; in fact, the boards are sometimes not even aligned consistently from one shot to the next within a single episode.